Remember in January when I said I wanted to knit 4 sweaters for myself this year? That works out to about 1 per quarter—and with the first quarter the year (somehow) gone, I should probably already have 1 sweater done. Ok, it’s not nothing. But it’s certainly nowhere close to being a sweater. In retrospect, I’m not sure starting with the trickiest sweater of the bunch was my best choice. This one is larger than all the other sweaters because the smallest size is still about 6” larger than my preferred size (though I’m knitting at a slightly tighter gauge). There are separate charts for left front, right front, back, and sleeves, plus a special setup chart for each, and none of them are the kind I can easily memorize. It starts with a tubular cast on, which looks lovely, but takes twice as long as regular ol’ ribbing. Actually, maybe I should be surprised that I’ve made it this far! I love it, though. The cables are squishy, the yarn is a gray blue with hints of purple that I just adore, and it’s so big it’s going to be more like a wearable blanket than a cardigan, if I ever finish it. When! I mean, when I finish it! 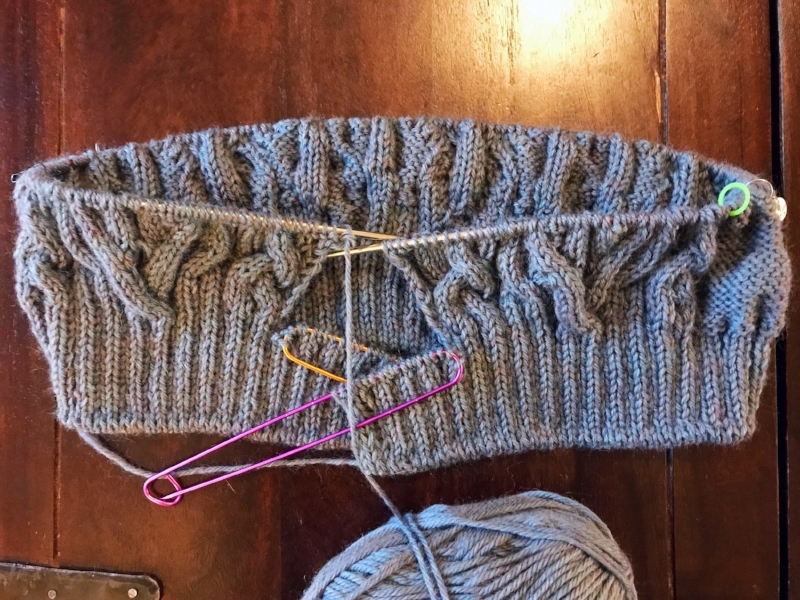 With all those charts, this project is the opposite of autopilot knitting—I can’t just grab it and knit a few stitches here or thereas children allow. This is “after the kids are in bed” knitting. So I’m kind of itching to cast on a 2nd sweater—something a little more straightforward (and smaller!) with an easy-to-memorize stitch pattern that I can work on while playing 87 games of Candyland. Time to start stash diving!